Once the artifacts were preserved, the decision was made to exhibit them. When I went to see the exhibition, the photo of the young couple at their wedding ceremony, surrounded by their excited family, immediately caught my eye. Yair’s father, Moshe Dor (Shohet), now 87, arrived in Israel from Iraq as part of Operation Ezra and Nehemiah, an Israeli-organized airlift that brought many members of the Iraqi Jewish community to Israel during 1950-52. He enlisted in the army and served in the Communication Corps, first as a soldier and then as a civilian contractor, until he retired at age 65. His wife, Rina, nee Aziz, had immigrated to Israel before him. 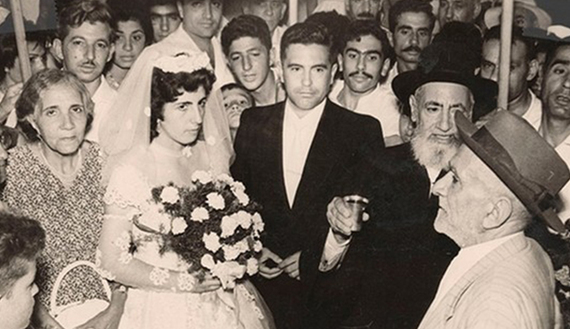 They met in Israel and settled in Ramat Gan, which absorbed more Iraqi immigrants than any other city in the country. Rina worked for years as the secretary of Na’amat, the women’s organization affiliated with the Histadrut, until she retired. The couple had two children. Yair, the eldest, was a career soldier in the Israel Defense Forces who retired from the army with the rank of lieutenant colonel. The government of Iraq and the National Archives are still engaged in a heated debate over who actually owns the Jewish archive. The Iraqi government insists, through its ambassador in Washington, that the archive must be returned to Iraq. The Iraqis claim that an archive telling the story of a community that lived in Iraq for centuries should be in the land of the Tigris and Euphrates and displayed at the Iraqi Archives for the public’s benefit. There are, however, no Jews left in Iraq. The last members of the community to leave were Yair Dor’s relatives. One uncle, Elias, immigrated to England in the early 1970s. A second uncle arrived in Israel in 2000. Maurice Shohet, son of Elias Shohet, now serves as president of the World Organization of Jews from Iraq, based in New York. Obviously, the Iraqi Jewish organization is opposed to returning the archive to Baghdad. In addition, Maurice Shohet contends that the wedding photo of Dor’s parents was exhibited by mistake. He claims it was part of a photo album of his childhood in Iraq, which he donated to the National Archives. Is it right for Jews to stab Arabs?